According to Wikipedia: A panino is a sandwich made from a small loaf of bread, typically a ciabatta (an Italian white bread). The bread is cut horizontally and filled with salami, ham, meat, cheese or other food and sometimes served hot. 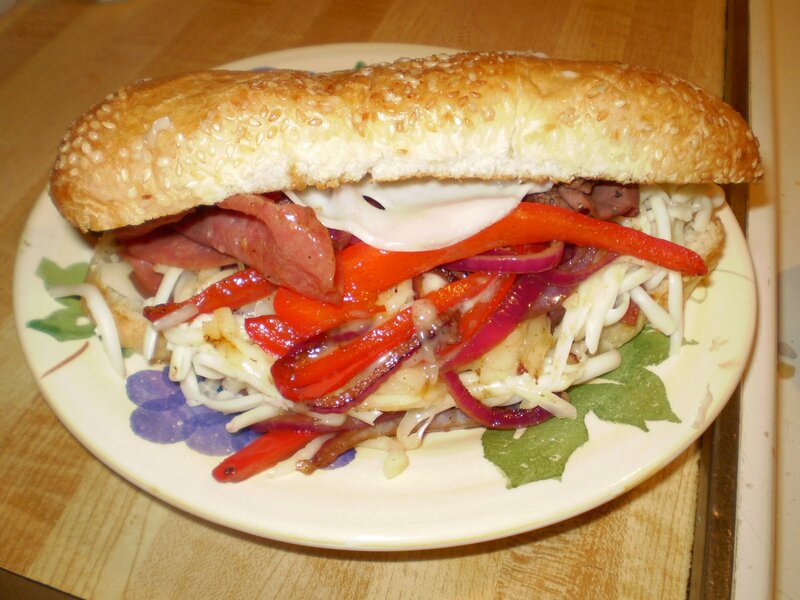 A grilled panino is buttered on the outside and grilled in a press. 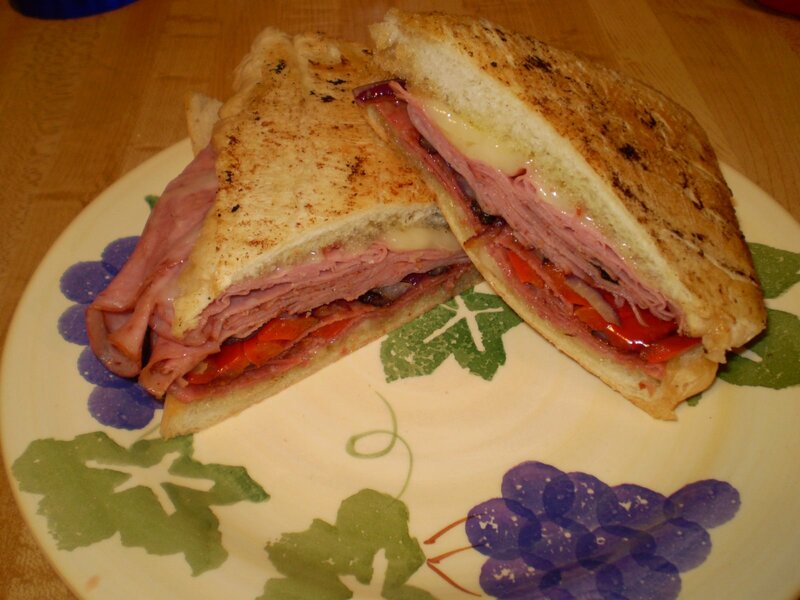 Even though I used French bread, I’m calling this a Balsamic Ham and Salami Panino. Turn the heat to medium high and put the bread face-down on the grill to warm while you slice red peppers and part of a purple onion. When the grill is hot, saute the veggies in extra virgin olive oil. When the veggies are tender, move them to the side and throw on the salami and ham. As the meat warms I sprinkle it all with Janz and toss it together with tongs to mix the flavors. 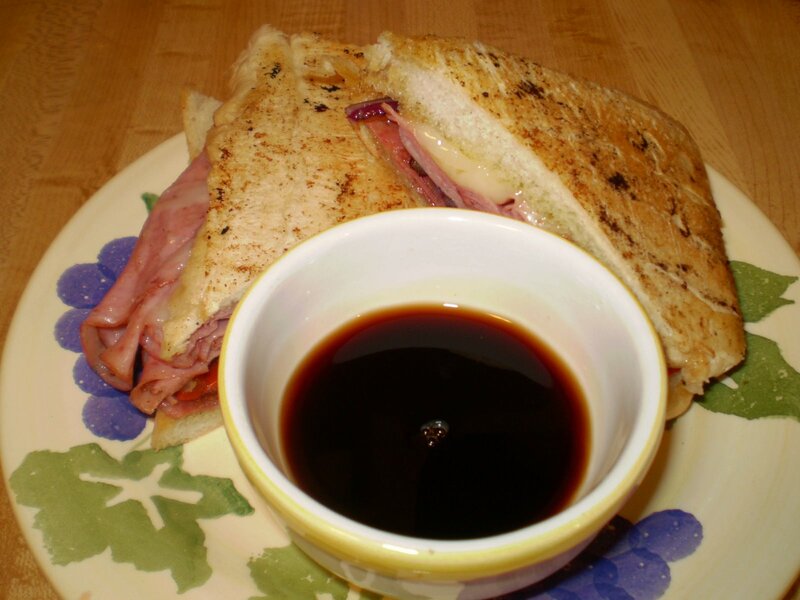 Add a splatter of Balsamic Vinegar just before you put the sandwich together. Press with a sandwich press* if you have one. If you don’t have a press, use the bottom of another iron skillet. When bottom of sandwich is brown, turn and press the other side. You’ll know it’s done when the cheese starts to drip down and sizzle on the grill. Serve with additional Balsamic Vinegar for dipping. 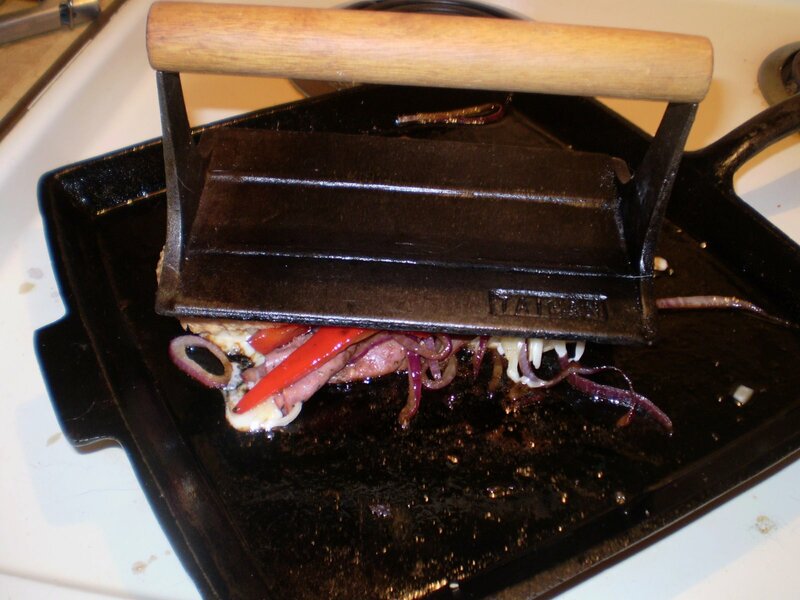 *My “sandwich press” is actually a bacon press. I bought it new a few years ago. I think it just cost $3-4 at the time. 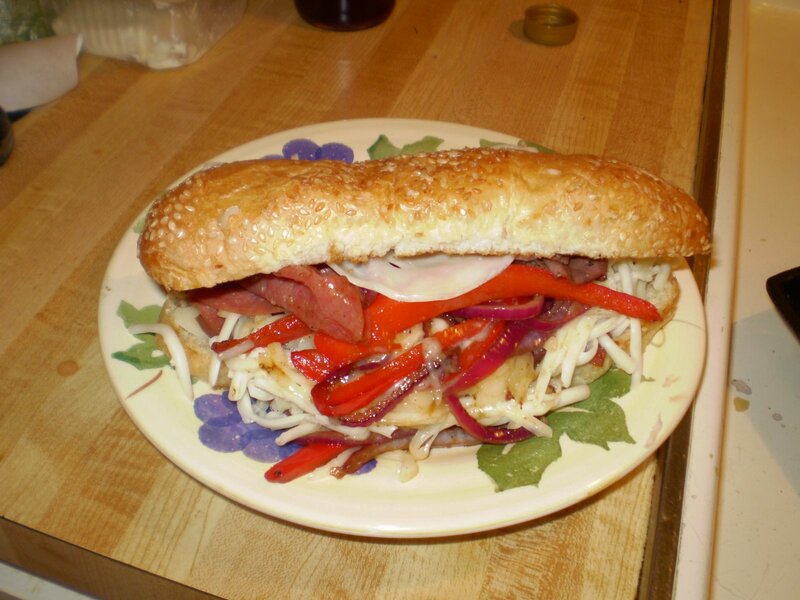 This hearty filling sandwich was for my 18-year-old son so I loaded it with a huge pile of pastrami, salami, red pepper, red onion and seasoned it with Janz and a couple of vinegars—it was good to the last bite. I start by turning on the heat under my handy dandy iron griddle. I cut a seasme seed hoagie in half and laid it flat on the grill to toast. 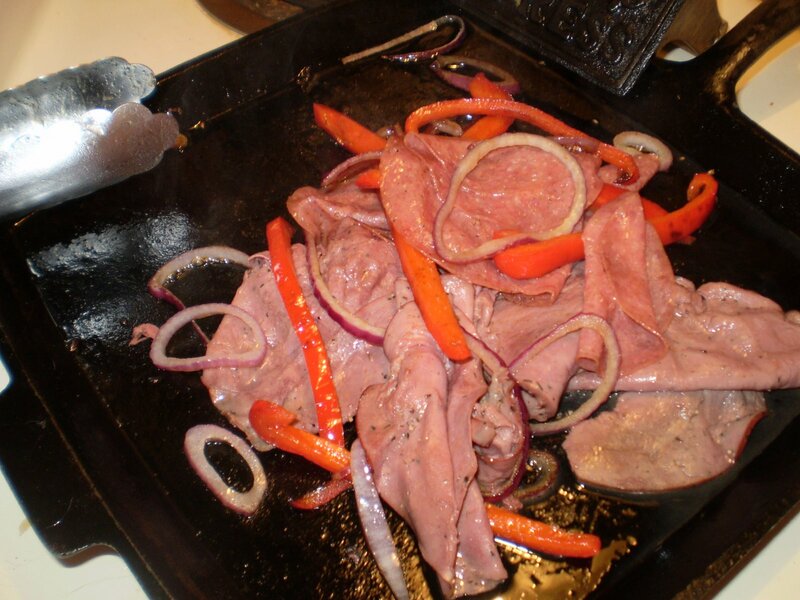 While the griddle and hoagie heat up, slice a chunk of red pepper into thin slivers and cut a few slices off a fat red onion and separate the rings onto the griddle with the red pepper. When the bread is slightly toasted remove it from the griddle and throw on the pepper and onion. Give it a splash of extra virgin olive oil and use tongs to toss it all together with a substantial dose of Janz Seasoning Blend and some red wine vinegar. When the veggies are tender add the salami and pastrami to the pile and add more seasoning and red wine vinegar. When the meat is warm and browing splatter with Balsamic Vinegar and toss the meat and veggies again. 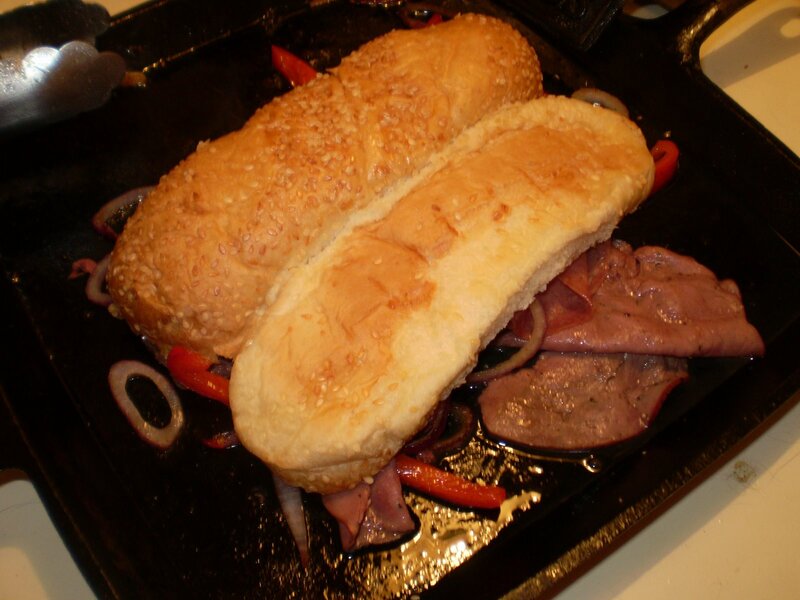 Put the hoagie on top of the pile of meat to warm. To prepare the sandwich, take the bread off the griddle and put slices of provolone cheese on the bread while it’s still warm. Use the tongs to place the onion and peppers on top of the cheese then pile on the meat and top with more onions and pepper. Grate mozzarella cheese on top of the pile. Turns out, this sandwich was gigantic and there was no way to smash it into a biteable layer. So I put it back on the griddle. 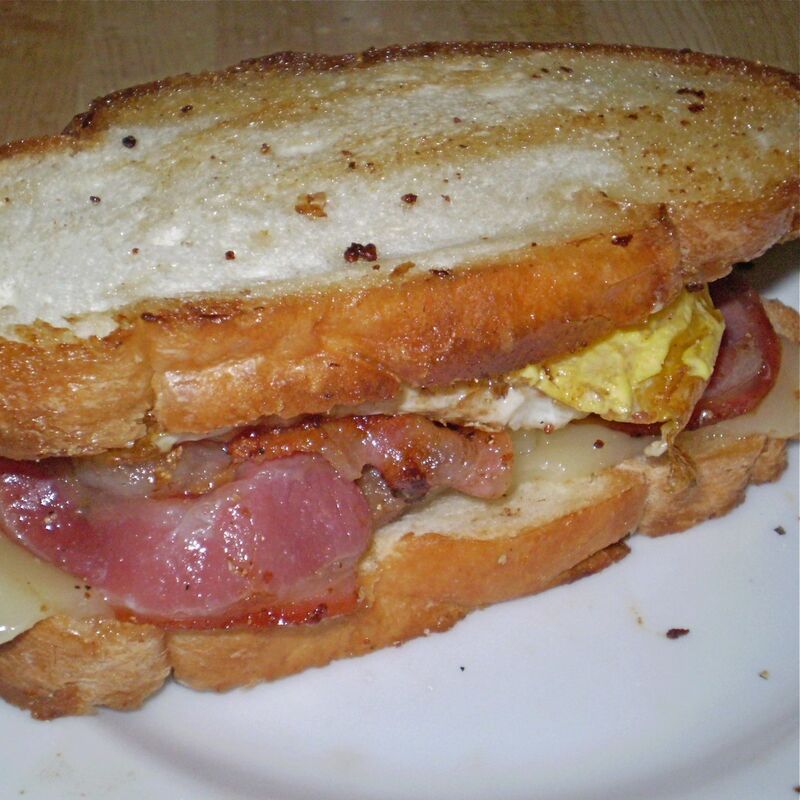 I did my best to poke all the insides between the layers of bread and then pressed it with an iron bacon press. I first spritzed the press with oil to keep it from sticking. A iron skillet would also work for this. There was a stray red pepper, but when it was done, but after I flipped the sandwich to brown it on both sides, you could get your mouth around it. 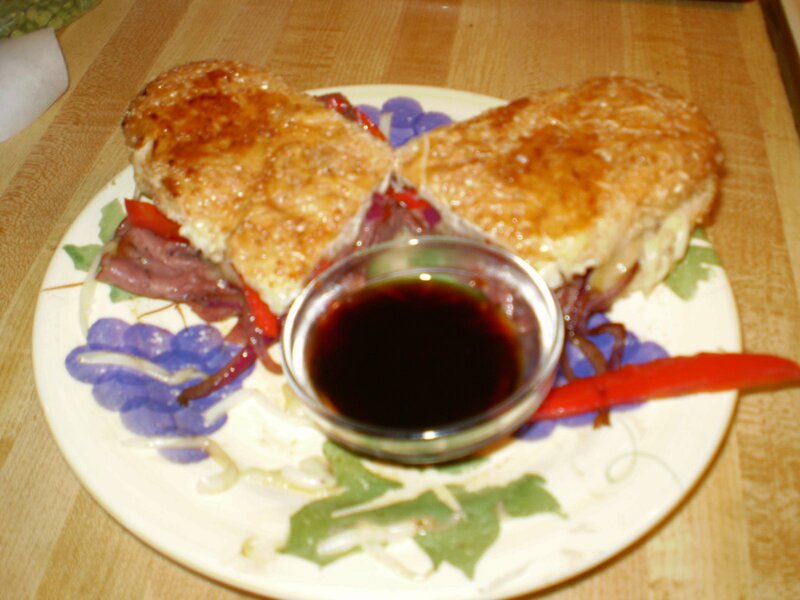 Cut the sandwich into half and serve it with a small bowl of balsamic vinegar for dipping.